A camping trip in the Serengeti National Park is a way to see African wildlife at its best—up close and personal. The Serengeti National Park is located in Tanzania and covers 5700 acres. The legendary national park is home to millions of animals. If you are looking for an once-in-a-lifetime safari experience, this is the place to do it. The Masai people, native to Tanzania, were using this area before Europeans first visited the area in the early 20th century. Then, in 1929 it was named a national park and the Masai were relocated when the area became a national park in 1940. •	Wildebeest Migration: A million Wildebeest travel through the Serengeti each year. Joined by hundreds of thousands of zebra and Thompson’s gazelle, the wildebeest travel in groups up to 25 miles wide through crocodile infested waters for fresh grazing. •	Predators: The Serengeti is home to a variety of predators. Lions, cheetahs and leopards all roam the vast plains. In addition, all three species of African jackal call the Serengeti Park home. •	Serengeti Plains: Wildebeest graze and breed in the Serengeti Plains from December to May each year. The Serengeti Plains is also home to large concentrations of zebra, gazelle, impala, hartebeest, topi, buffalo, and waterbuck during the rainy season. •	Western Corridor: If you come to the Serengeti from May to June hoping to see the legendary Wildebeest Migration—this is the place to see it. However, during the rainy season, many roads will be impassible. The Western Corridor is also home to Nile crocodiles, colobus monkeys and the rare martial eagle that live near the Grumeti River. •	Northern Serengeti: Running from Seronera in the south to the Mara River (also the Kenyan border), this area is a great place to find elephant, giraffe and dik dik. 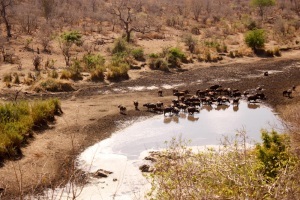 If you come during July, August and November—you can also see the Wildebeest Migration here. Overlanding is a popular among people traveling throughout the region. Most overlanders do choose camping because of the cost-savings and the unique experience. Camping in the Serengeti can be a challenge, it’s very basic and, depending on the time of year, actually may not be all that isolated. Many tour groups use Serengeti campsites for their camping safaris, so you may find that you are sharing facilities with more people than you counted on. There are also campsites right outside of the park. You will find that prices are more cost effective, and it will likely be quieter. Camping outside the park is sure to be an adventure, as well. There are no fences around much of the park, so wildlife often wanders outside the park limits. For non-Tanzanians park entry is $50 per person, per day, plus $40 per vehicle/per day (for a total of $140 per day for two people—payable in USD only, credit cards are accepted). Campsites offer overnight options within the park. Camping starts at $30 per person, though it is very basic, you’ll need to provide everything, including your own water. If you do plan on doing a self-drive, you’ll need a 4x4, recovery equipment and an experienced driver.